In the past couple of weeks, I’ve found myself in a reactionary season where I haven’t been finding peace. I don’t like being busy because it stresses everyone out, yet that’s exactly where I am. My reaction time is slower, I have that uncomfortable feeling you get when running late and the organized part of my chaos is buried deep beneath the chaos. There is no a-game here. And if I’m honest, saying I brought my b-game is even a stretch, but I’m feeling generous. I don’t like feeling this way but over the years, I have realized that this valley is part of the cycle of my life and I’m learning to roll with it. I accept the fact that I’ve been in these weeds enough to know that I will eventually find my way out. 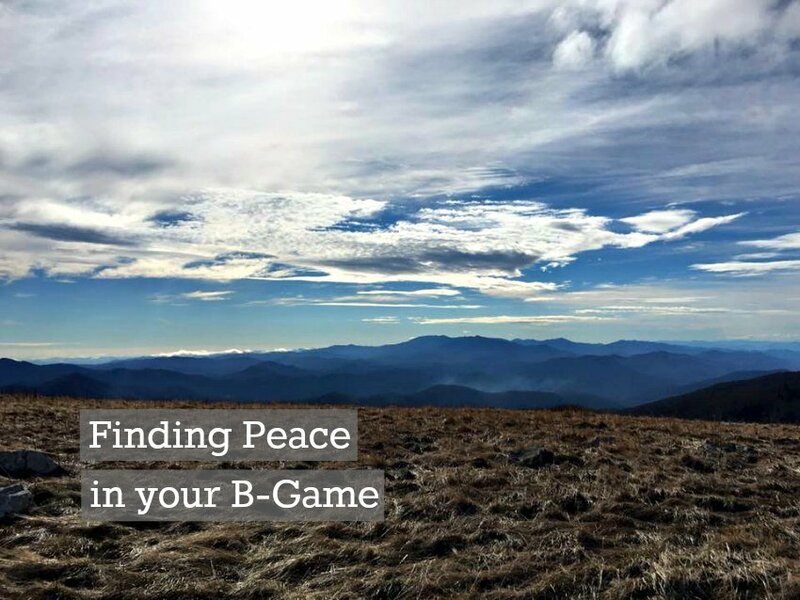 The more I learn to find peace with my b-game, the quicker I can turn the corner. As a Disney Parks Moms Panelist, I sometimes get asked if planning our days at Walt Disney World in advance takes the spontaneity out of a trip. I understand that many people are not like me and planning so much of a vacation ahead of time seems too much like real life. My answer is always that when we build in space each day for on-the-fly decisions, we really get the best of both worlds. I love having an outline of our plan so we can make sure everyone gets to hit their favorites, but we also like to make some choices in-the-moment so I build that time into our days as well. You know what? Life is the same way. I am not my best self when every moment of my life is spoken for. I need to allow for pockets of time that are completely unplanned and I need to realize that some of this time will be used for fun things, while other times, it will be used for necessities. This week, we had to get some work done on our van. I spent several hours I hadn’t planned on waiting for repairs and shuttling my family around since we were down to one vehicle. It was a brief inconvenience, but I failed to build extra time into our schedule for it. Even if I didn’t show it, I was in a frantic state a lot of this week worrying about how I would accomplish all of my goals. I’m only human and my human truth is that sometimes things don’t get done. And you know what? Prince died. And that stopped me in my tracks. His death wasn’t something that affected me as emotionally as some, other than the fact that it’s always sad when someone dies. But what I did think about was that, at the age of 57, I’m sure he didn’t think Thursday, April 21, 2016, would be his last. So I sat with that for a little bit and decided that no matter what my life is about, whether I am doing something great or fancy or something mundane or even trivial, I need to allow space to fail or to change. I can’t be flexible if everything is crammed together. I need room in my heart for peace to grow. That kind of peace does not come from poor planning and stacking my schedule and it also doesn’t come with 10-steps for time management. I’m not talking about self-care, either, though I do believe that’s necessary. It’s about breathing. It’s about depth. When my boys start to lose themselves in frustration, I encourage them to take deep breaths. They tend to start with quick, shallow breaths to get it over with but what is that? There is no oxygen at the surface and it only adds to the stress. But when you think about it, taking a deep breath in those moments of frustration is actually quite difficult. It is work to calm an anxious body long enough to count to five (inhale) and 1-2-3-4-5 (exhale.) It needs to be intentional. For all my planning and my love of routines, I continue to fight intentionality. I want things to come naturally to me and when they don’t, I am tempted to say, well I guess that must not be for me. When I am forced to bend my nature to something healthy that isn’t my gut reaction, my insides fight it every step of the way. It’s a constant battle. When I don’t allow my soul time to rest, it’s nearly impossible. I don’t want busy. I don’t enjoy it, I’m not proud of it and I don’t wear it as a badge of honor. I don’t want balance either because that feels like a fancy way to say busy is ok if you do it right. 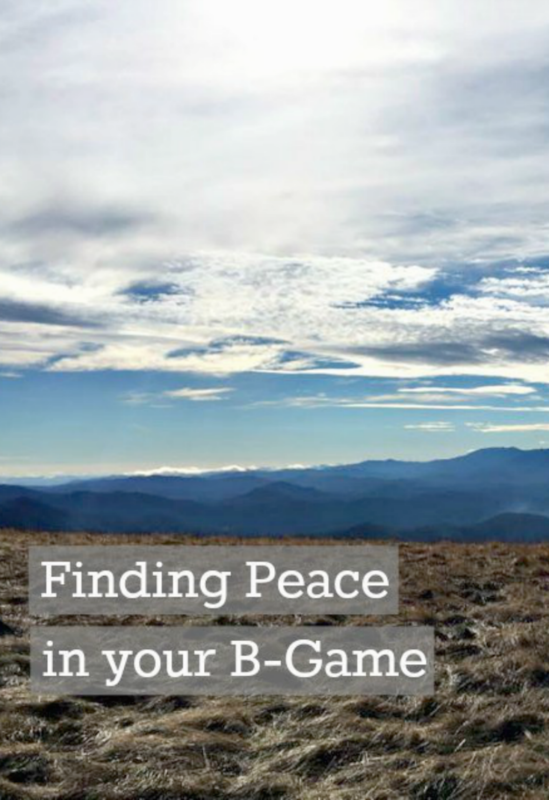 What I want and what I truly need is peace; peace in the great weeks, knowing I am on my a-game and loving it, but I also need to be finding peace in the weeks when my body slows, when life is harder and I trip over my own feet. So here’s what I am going to do about it. I tend to make lists of what I need to do when things get out of control. Lists, lists, and more lists of needs that aren’t being met. The idea is to get the needs on paper so they don’t clutter my mind and that does help but they can also overwhelm. Starting now, I’m going to keep a notebook next to my bed so each night I can quickly jot down what I did that day, NOT what still needs to be done. It’s so easy to feel overwhelmed when I only look at the miles ahead. I don’t want to lose sight of the progress I have already made because that’s when the downward spiral begins. My list may include my personal wins but I also plan to write any moments that made me feel great like a compliment from someone, a smile in the grocery line or a hug from my kiddos. The good stuff. It’s a spin on One Thousand Gifts (affiliate) but not simply things I am grateful for. Sometimes I really need to see that I accomplished something on those days when I feel like I did absolutely nothing. I’ll keep you posted on how this goes and I’d love it if you want to join me with your own list. Instead of a to-do list, I’m calling it my Ta-da list! I always sleep better when I end the day acknowledging the good things, praying and giving thanks rather than worrying about the needs that still haven’t been met. There will always be more to do. Always. I’ll tweet some of my wins with the hashtag #MyTaDaList and I’d love it if you would hop in and join the conversation. If you need a little encouragement to keep going on those slow days (and I think we all do) I will be there to cheer you on. Let’s do this together. I know we can! Comment below to tell me how you survive your b-game seasons. Have any tricks in your back pocket to share? I so need these tips right now! Thank you for sharing.